Home / Engagement rings: Custom Design / Art Deco Engagement Rings / “Aria” Champagne diamond dress ring. Champagne Diamond yellow and white gold band. 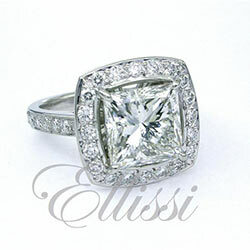 This is a ring we were commissioned to make with a 3.00 ct champagne diamond. It is set in a round bezel of yellow gold and has mille grain detailing set with 3 pt diamonds. Two central chevrons rise up to join the main diamond with this central area skirted with a row of diamonds on each side. The setting is open in middle in 6 areas. In this photo you can see through to the rear yellow gold band.